Novak Djokovic is the overwhelming favourite to secure a fourth Wimbledon title on Sunday but he admits he feared his best days were behind him when his career nose-dived over the last year. The 31-year-old former world number one won the last of his 12 majors at the 2016 French Open when he completed the career Grand Slam. And after a shattering quarter-final exit at this year’s Roland Garros, which saw his world ranking slump to its lowest in 12 years, the Serb even considered sitting out Wimbledon where he has been champion in 2011, 2014 and 2015. However, on Saturday, Djokovic was the big-hitting, chest-pumping star of old as he defeated old rival Rafael Nadal 6-4, 3-6, 7-6 (11/9), 3-6, 10-8 in an epic semi-final to book a Sunday title showdown with Kevin Anderson. 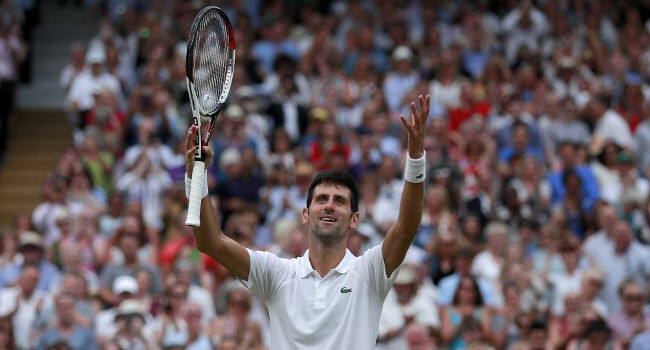 “Yes, there were moments of doubt, of frustration, disappointment, where you’re questioning whether you want to keep it going,” said Djokovic back in a Slam final for the first time since finishing runner-up at the 2016 US Open. It was at Wimbledon last year where his troubles started. An elbow injury forced a retirement in his quarter-final and he sat out the rest of 2017. He was then knocked out of the Australian Open in the last 16 in January by Hyeon Chung, then ranked at 58. Taro Daniel, the 109-ranked Japanese player, stunned in him in Indian Wells before Benoit Paire, at 47 in the rankings, knocked him out in Miami. In what was becoming a familiar tale, Martin Klizan, at 140, ousted him in Barcelona before there were signs of life with a run to the final at Queen’s Club on the eve of Wimbledon. “I managed to overcome challenges and obstacles, get myself to the final of a Slam,” added Djokovic. “Obviously if you told me that six months ago, I would take it right away. At Wimbledon this year, he has battled unruly crowds, claiming elements of Centre Court were “unfair” to him in his win over home hope Kyle Edmund, and bizarre scheduling. Seeded at a lowly 12, he suffered the indignity of being exiled to Court Two for his second round. He will take a 5-1 career record over 32-year-old Anderson into Sunday’s final. His only loss was in 2008, while he has twice defeated the big-serving South African in two of his trophy-winning campaigns at Wimbledon in 2011 and 2015. Anderson is the first South African man since Brian Norton in 1921 to reach the Wimbledon final. He is also just the third African to reach this stage after Norton and Jaroslav Drobny who represented Egypt when he made the championship match in 1952 and 1954. “I really hope that it’s a source of inspiration for kids,” said Anderson after his 6-hour 36-minute epic semi-final win over John Isner, the second longest singles match ever played at a Grand Slam. The 2017 US Open runner-up had knocked out eight-time champion Roger Federer in the quarter-finals, also in five sets, saving a match point along the way. The Florida-based Johannesburg-born player has spent 21 hours on court getting to the final. Sunday’s final may not be easy on the eye, however, with Anderson having fired 172 aces so far while boasting the fourth fastest serve at 140mph (225.3 km/h). “I don’t know if I’ll be the clear favourite in that one. I think we’re quite even,” insisted Djokovic. “He’s definitely playing the tennis of his life. He’s coming off from two epic marathon five-set wins. I don’t think he has much to lose.